Our Satisfaction Guarantee: "We guarantee your absolute satisfaction - 100% of the time." Return any product within 60 days after delivery for exchange or refund. NO questions asked. NO restocking fee. Shipping and handling cannot be reimbursed. Even if you purchased a product with "Free Shipping”, shipping costs will be deducted from your refund. Refunds are issued within 14 days after we receive the return package. An RMA number is required for all returns. Please DO NOT send products back to us without an RMA number, otherwise, your return cannot be processed. Call us at 510-264-9988 to obtain a Return Authorization (RMA) number and return address. Return freight must be shipped prepaid. We recommend package insurance. You are responsible for risk of loss/damage on all returned packages. Save your UPS or USPS return tracking number, and if possible, email it to us so we can track the return. Shipping and handling is non-refundable even on products purchased as Free Shipping. For international shipments, customs fees and shipping & handling fees are non-refundable. Returned product must be clean, undamaged, and complete with all manuals, accessories, documents and packaging. The items must be in a resellable condition free of any non-removable labels or writing on the product or product packaging. The UPC code must be intact for you to receive credit. 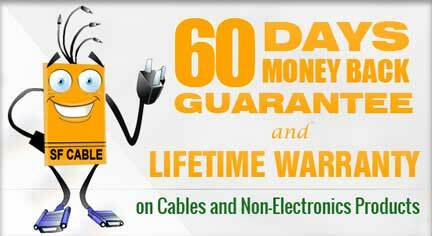 Custom cables are non-cancelable and non-returnable.